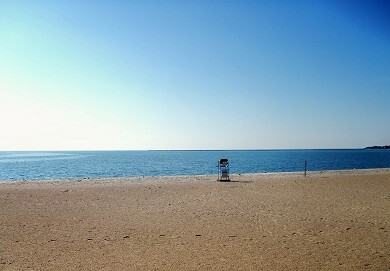 Kalmus Beach is a large beach off of Nantucket Sound with plenty of room for younger kids to run around and explore. It is a popular beach with windsurfers and kiteboarders due to its consistent breezes. There is a parking available in a large municipal lot for a $20 daily fee. It's a wonderful beach with boats coming into the harbor. You can see boats and ferries leaving and entering the harbor, as well as windsurfers speeding along. The sand is soft, the view is lovely, and the beach is nice and big for playing paddle ball, spike ball, or the game of your choice. Beautiful beach! Beautiful view! Great Snack area. Kalmus beach has always been our favorite because you have the choice of calm water on one side and waves on the other side. Kalmus was nice because it is 'separated' by a jetty which one side is the harbor with a smaller, more kid friendly beach while the other side is longer but more ocean facing. Great snack shack, clean bathrooms and huge parking lot that was pretty damn empty all week which was a plus. Great, steady wind. Separate place for windsurfers. Snack bar. Good walking beach. Can walk over to Memorial Beach and the JFK Memorial Monument. Near the house, great snack bar, a lot of space, and shallow for kids. Just watch out for the sea gulls who will take your food. Beat the Crowds & Avoid the Lodging Tax - May & June availablity + No Tax 4th of July week!!! Direct Waterfront Home on Nantucket Sound w/AC! Summer 2019 Prime weeks available. Distance to beach: On its own private ocean beach!! !